KERALA, INDIA - Hundreds of extra police in southern India were on high alert Wednesday for the scheduled opening to women of all ages of one of the country’s most sacred Hindu temples. Thousands of people, many of them women, have marched in recent days against females being allowed to pray in the hilltop temple at Sabarimala in the southern state of Kerala. India’s Supreme Court in September overturned a prohibition on women of menstruating age, between 10 and 50, from entering the site dedicated to the deity Ayyappa. The centurieslong ban reflected an old but still prevalent belief that menstruating women are impure, and the fact that Ayyappa was reputed to have been celibate. Wednesday was the first day that the temple, set on top of a hill in the Western Ghats mountain range, opened since the court order. It closes again on Monday. In recent days groups of chanting women in traditional sarees have stopped vehicles along the route and at Nilackal, the base camp below the site, preventing women from proceeding, press reports said. Those who were stopped on the way to the site, where an annual pilgrimage later in the year attracts millions of devotees, included female journalists. “No woman belonging to the banned age group of 10-50 will be allowed to travel further from Nilackal and offer worship at the shrine,” the Press Trust of India news agency quoted one woman as saying. “I say ego because no devotee who has faith in Sabarimala will try to break the 2,100-year-old rule. Either you believe in the celibate deity or you do not. 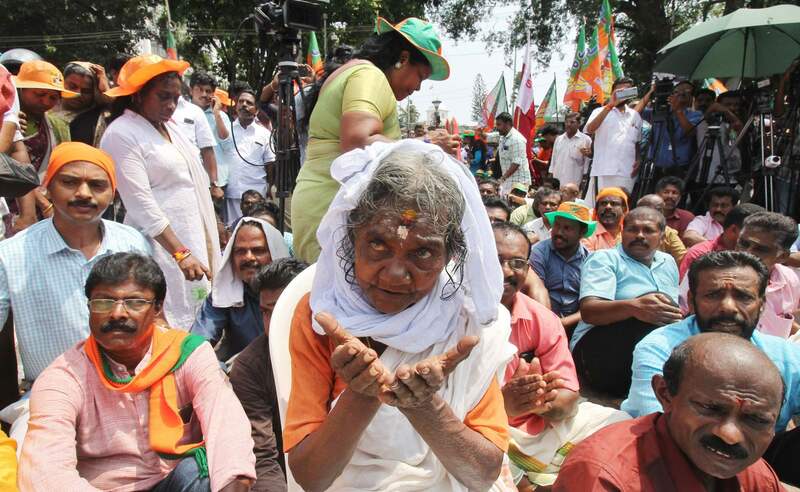 Moreover, there are other Ayyappa temples women can visit,” the Times of India quoted him as saying. He added that several “scientists” had concurred with the view that the “positive energy” in a temple can be polluted by the entry of menstruating women. 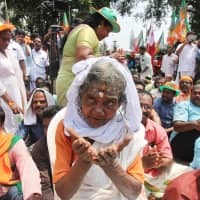 Prime Minister Narendra Modi’s Hindu nationalist Bharatiya Janata Party and its allies have supported marches in different parts of Kerala over the last few days against the court order. The BJP has historically been on the margins of state politics in Kerala, but vowed “a massive agitation plan” if the ban was not reimposed. But Kerala’s Chief Minister Pinarayi Vijayan said no one would be allowed to block devotees from proceeding to Sabarimala. “Stern action will be taken against anyone who prevents devotees from going to Sabarimala,” Vijayan told reporters. Hundreds of additional police had been put on high alert across the state, authorities said. “Things are under control, and we are closely monitoring the situation,” Kerala police spokesman Pramod Kumar said Tuesday. “It is our constitutional right, and we will stand up for it,” said Trupti Desai, an activist who planned to visit the Ayyappa temple despite receiving death threats.